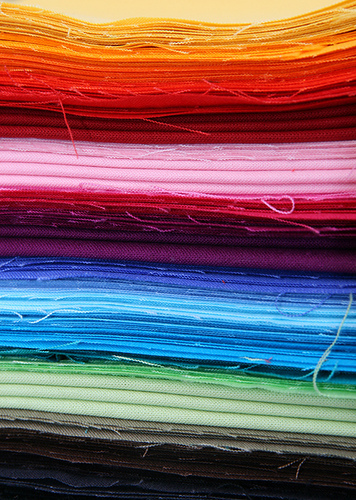 Fabric is, by its very nature, addictive: from the moment we enter the world, we experience texture and touch, and are surrounded by woven and knit fibers of various scales and softness. I suspect that even folks who don’t sew (I’m assuming there are such people, although I myself do not associate with such) are at least subconsciously aware of the impact that fabric has on us: we all have clothes, after all, and household linens, and all of us have found some way to organize and store those fabrics in our homes. For some, organization is pretty loose–I totally knew a kid in college who took stuff out of the dryer, made a pile, and kept working through it until it was all dirty again (and in a different pile, this time on the floor), and then washed that pile and started the cycle over again. Not a very sophisticated system, but it was organized, in a way. I want better than that for my fabrics. 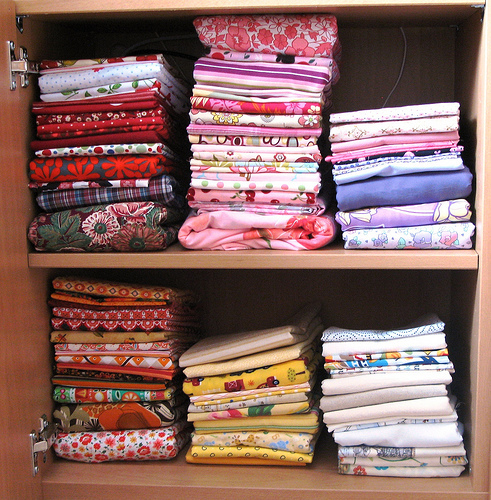 Before I had a sewing space to call my own, I kept most of my supplies and fabrics in a closet in the hall–this was years ago, in an old rental duplex I lived in, and the closets were wonderfully deep and roomy. I didn’t have much of a system for how to find the fabrics later, though–I had pinned slips of paper to each piece and labeled them with the number of yards and the pattern I planned to use when I finally sewed it into something yummy. But I kept adding to the stash and not sewing anything up, which resulted in going through all those fabrics when I moved out of that apartment and learning that the patterns I’d selected for each piece were woefully outdated and no longer appealed to me. Fabric fail. 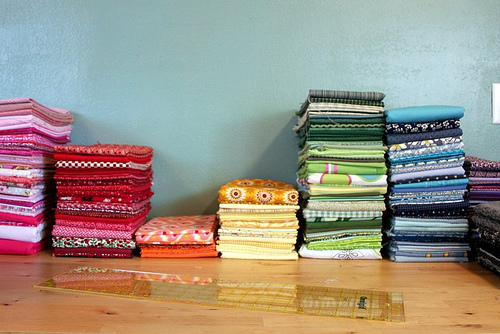 These days I think a lot about sorting through and finding a permanent, sustainable system for organizing my fabrics. Now that my studio is full of only my fabrics (and not the fabric that belongs in the shop), I have higher hopes for it–y’know, like that it’ll get to BE something some day. So I’m considering my organizational options. The first and most obvious to me is to sort by color, ROYGBIV-style. Photos like this one inspire me. 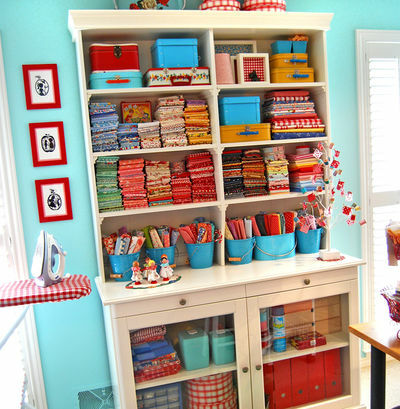 Over at Allsorts, she’s used an Ikea hutch and cabinet to store all her fabrics and sewing supplies, all color-coded and stacked neatly where they can be seen. If out of sight equals out of mind, then having your fabric where you can both see it and get to it is a huge asset, and I’m thinking will make it easier to plan for. I’m also pretty sure that sorting by color would inspire new and unthought-of fabric combinations and could be a huge jumpstart to new creative ideas. The trick to this system, though, and making it work, seems to be the folding. Making each piece approximately the same size and shape allows you to stack and store and pile them in such a way that each fabric is given equal “weight” in terms of the emotional value we place on it. A larger piece using another system might get preferential treatment, you see, and sorting by color, we’re really evaluating the fabrics based on how they fit into an overall design scheme or palette. Where to put them once they’re sorted out is the next trick. I like to be able to see them at a glance, but I admire systems like these, where boxes and bins are labeled and then placed where you can get to them lickety-split. Efficiency? How about lidded bins? They’re easy to store, easy to move around, totally see-through, and generally inexpensive. They also lend themselves to various methods of organizing, and we’ll look at those in the coming days–I’m still working on picking my own, based on my furniture…. How about y’all? Any methods popping to mind as you picture your stash? I have to admit I have a pretty Fab sewing room. My super cute hhubby let me California Closets it up. I even have a custom made drawer just for patterns. Sadly it is already full. So I keep my patterns just for me in there and I have moved all the kid and gift patterns to cardboard pattern boxes neatly tucked into a cubby. 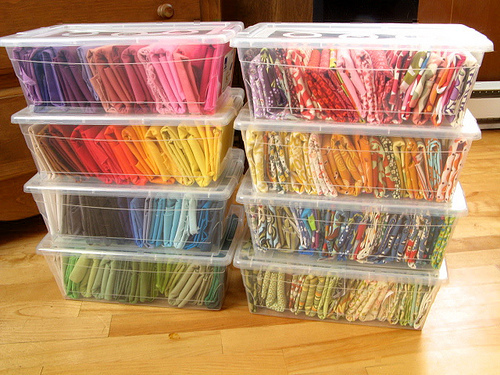 I pretty much organize my stash by color. 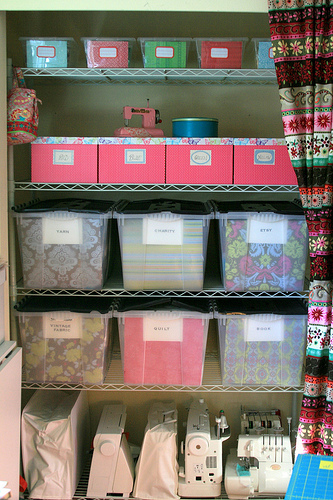 I went for the lidded bins because they were cheap, locally available and fit into my small sewing room. I’ve read that they can be problematic in humid weather, though. I don’t really understand why as they’re closed, but it *would* be a terrible shame to lose fabric to *mildew*, so I’m thinking about maybe poking (would a hot awl work?) or drilling air holes in them.